These part-hydraulic/part-pneumatic systems are prone to failure. The typical failure mode is where the rear end of the car "hunts" for the correct ride height, but doesn't find it, and the rear of the car ends up bouncing up and down continually. Rolls Royce used this system back in the '70s, and it didn't work well for them either. These systems are failure-prone and are expensive to repair. Because of this, Jaguar produced a kit to remove the self-levelling rear suspension and replace it with conventional shocks. This kit contains every part needed to affect the repair, including springs, shocks, spring seats, nuts, etc. There are cheaper kits available, but they aren't worth messing with. 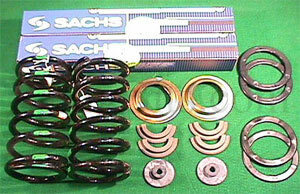 These kits re-use the original springs and leave the car sitting too low in the rear. The original springs were designed for the hydraulic shocks to support some of the car's weight, and are therefore too weak to support the car by themselves. Our JLM11698 aftermarket kit is exactly the same as the OEM kit except we use Boge brand shocks that come with a lifetime warranty. Our unwavering recommendation is to never repair the self- levelling suspension, only replace it with the our shock/spring kit. You'll spend at least as much on the repair as for the kit, only to have the system fail again. And again.